Muscles only have one function - that is to contract. Because of this, we are built with sets of muscles to oppose each other, otherwise we could not move. It's also a common sign as we get older that, we become shorter. Unless we stretch, we can't restore our muscles best resting point. You will hear many older folk complain that their ribs are rubbing on their hip bones, and they are and very uncomfortable. Stretching also has an effect on hormonal release and balance. Survival102, that's good info to know! Some of that was news to me. 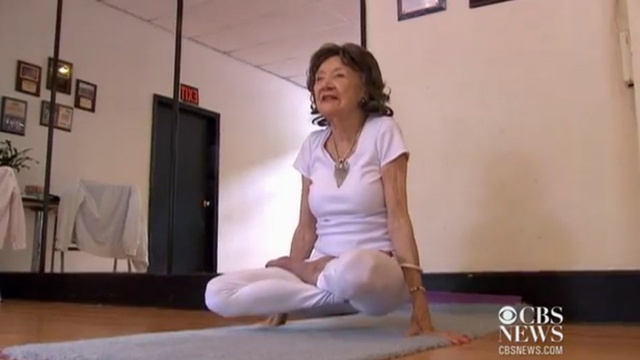 93-year-old Tao Porchon-Lynch is an inspiring Yoga Instructor and Can Still Pose Perfectly! She has been named Guinness World Records' oldest yoga teacher! We made a big batch of the raw vegetable and fruit juice including such antibiotic ingredients as garlic peppers and ginger. Good stuff. It really is... Pretty spicy the way we make it but it changes every time and people can make the juice however they like. Daughter and I have been using horseradish, regular red radish, ripe tomatoes, peppers, lemons, ginger and garlic...fresh mint plant, dark greens, apples, oranges, cucumber or celery, etc. Next time we will use kale. When I drink it I have about five times the energy. Update now my daughter and I use the Nutri bullet Nutrition Extractor, instead of our juicer. It does the job in one twentieth of the time start to finish. There is no pulp. It is all ground up into the drink. Sometimes there is a little noticeable pulp in the drink. If it's more than I want I give it another few minutes or take some out add a little more water and do a smaller batch at a time. Then I get the other part done. Talking just an additional couple minutes. We loved our Jack La Lanne juicer (inexpensive one) but it took a really long time to set it up and to clean...I just couldn't do it... Now we do the Nutri Bullet. My youngest daughter and her man, here in town also do the Nutri Bullets each AM. I am happy about how much better I feel when I do this kind of juicing. Unless our kitchen is too crammed full of stuff, or we run out of ingredients we keep it up. We recently got back to it. BTW it doesn't take many greens at all so just get small batches of fresh greens... We shop a little more often quick trips. I recommend adding the raw cashew to the greens, yum. We put frozen fruit in it too and sometimes yogurt.